Perfect for both adults and children, a camping holiday at Camping Butterfly is a dream come true. This luxury camping site offers a great many activities to enjoy and from lakeside views to activities and excursions, those who have a taste for camping in luxury will certainly not be disappointed. For further details or to book your much-needed holiday, please contact Lux-Camp for more details as soon as possible. While luxury camping certainly has much to do with the natural surroundings such as the splendid vistas offered by Lake Garda, we should also remember that family-oriented activities are indeed an added bonus. Thankfully, numerous of such attractions can be found here. These will include (but are not limited to) archery lessons, bike hire, golf and table tennis. Thankfully, all are located but a stone's throw away from the many on-site bungalow tents and mobile homes. 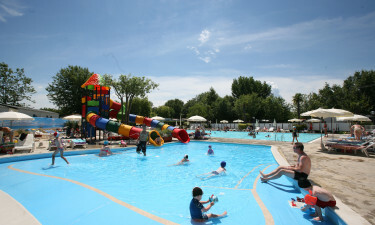 Why should I take my family to a luxury camping site such as Camping Butterfly near Peschiera? When parents need a bit of "alone time", Camp Butterfly can help. A children's play area is located within this holiday camping site and entertainment specifically geared towards your young ones is never far off. The entertainment and activities are available from mid June to the beginning of September. From a pool designed for children to playgrounds and themed events, you can rest assured that they will never suffer from boredom while they are camping in luxury. As before, these amenities are all quite close to the luxury tents and pitches located within the site. 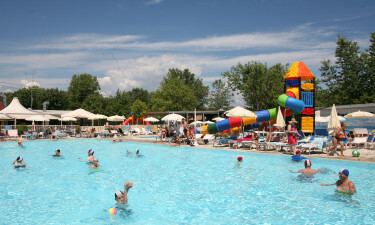 While there are a great many bars found within the nearby village of Peschiera, Camp Butterfly will provide you with on-site dining options that are all close to your mobile home or bungalow tent. Of particular interest is The Basilico. Fresh meat, fish and pizza are served up daily on a made-to-order basis. There is also a bar located within the restaurant if you wish to partake in a local beer or quench your thirst with a cocktail. Finally, note that there is a supermarket located within Camp Butterfly that offers local produce, fresh bread and a variety of other luxury camping items. As always, this is found within close proximity to all luxury tents and mobile homes.